Two or four consoles can share access to a single computer or switch. Turn a ServSwitch™ inside out and what do you have: the flexibility to access a single CPU from different points in your office. 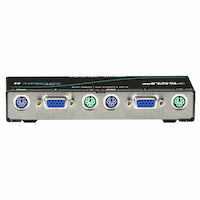 These “reverse” KVM switches enable two or four users at separate keyboard, mouse, and monitor consoles to access a single computer or KVM switch. Depending on how you connect it, you can use ServShare as a video splitter to up to four video displays, or four users can access a KVM switch. At its most flexible, ServShare—used with other ServShare units and ServSwitch KVM switches—enable many users to connect with several different systems. Call for a free one-hour consultation on your specific application. Talk to one of our application engineers at 877-877-2269. The flexible solution for resource sharing. Access a single CPU or ServSwitch from up to two workstations. Access a single CPU or ServSwitch from up to four workstations!